See how SmartVent works as intake and as an exhaust vent with this 3d interactive. Make sure you download it so you can show your customers exactly how our ventilation solves almost every ventilation issue. 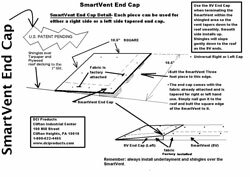 What is a SmartVent End Cap? The New, Patent-Pending ‘Universal’ SmartVent End Cap can be installed Right Side or Left Side, as you begin your SmartVent run or end the run. Designed with the contractor in mind, this easy to install end cap makes working with SmartVent simple and cost effective. Use it to end a SmartVent run near a dormer, valley, hip, chimney or skylight. Use it to begin a SmartVent run other than at the rake edge. 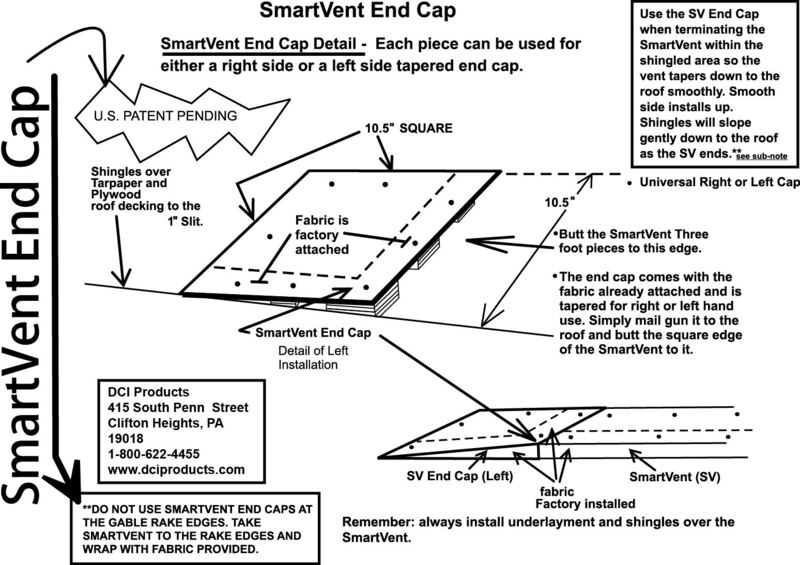 At the rake edge, wrap SmartVent fabric around a full piece of SmartVent as shown in the SmartVent directions. Refer to the technical drawing – click to enlarge details. vent providing superior air flow and attic cooling.